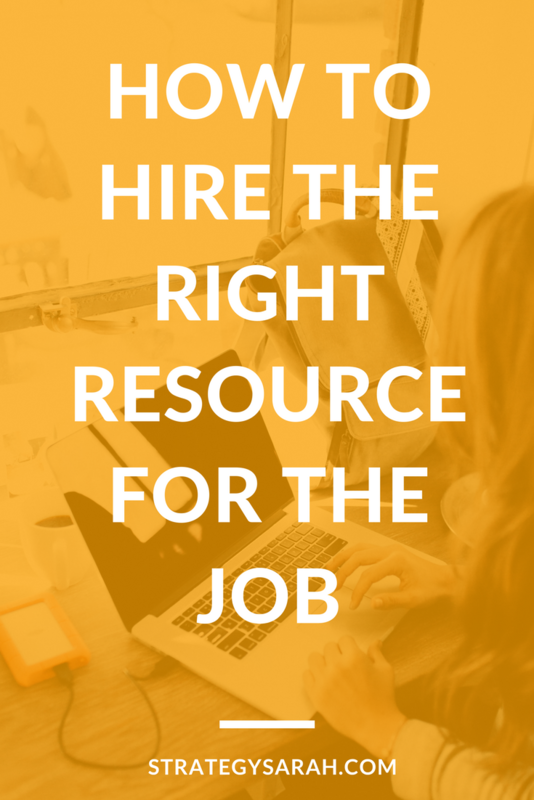 Do you know how to hire the right resource for the job? If you’re burned out, can’t keep up the pace anymore, considering quitting, or have already lost good people from your team, keep reading. You need to fill a resource gap, desperately. Or maybe you’re just starting to feel the pinch and want to be proactive to keep the right work-life balance for yourself and your team. What would it feel like to know exactly who you need to hire, and when you need to hire them? Here’s how. There is truth to the old adage that you get what you pay for. When you’re the one in charge of managing workload and capacity, this can feel daunting. But, “you get what you pay for” doesn’t necessarily mean that you need to always pay top dollar. What you do need is to be super clear on exactly what problem you are trying to solve. Getting super clear on what problem you are trying to solve has potential to save you boatloads of money, time and headache – even if you end up choosing a premium price point solution. As an example, let’s look at vehicles. You’re going to pay a whole lot less for a Kia than you are for a Lexus. But there isn’t a right or wrong answer to which vehicle you should buy. (Well, unless you ask my husband. Then expensive is always better.) Both brands have their place in the world and consumer bases for whom their vehicles meet the needs. If your focus is on price point, and an efficient way to get from Point A to Point B, a Kia will likely fully meet your needs, and you would be wasting your money on a Lexus. You might enjoy it, but perhaps not for the price premium you would be paying. (Full disclosure: I drive a Kia.) If luxury and comfort are primary goals, and price point isn’t as much of an issue, by all means, get that Lexus! The same principle applies with business hires. There’s a reason all three exist as viable options that solve different needs. Before you make a hire, consider exactly what the problem you’re trying to solve and what the need you’re trying to meet is. How defined is the work that you want this resource to do? Highly defined work that simply needs someone to execute is a great place to hire a contractor or freelancer. Broadly defined or undefined work is a great candidate for a full-time hire or an agency. If the work is project-based, specific and won’t be ongoing, you should consider working with an agency that can solve a set scope of work. Do you want to pay hourly for a resource or a flat rate for a set volume of work? Full-time employees may be hourly or have a set salary with expectations of what “full-time” hours are. Freelancers and contract labor typically charge hourly, but may set flat rates or retainers for specific projects. An agency will almost always charge a flat rate for a specific body of work. You’ll likely pay a freelancer or contractor higher hourly rate than you would for a full-time employee, but you have more flexibility in the number of hours you pay for and the length of time the contract runs. A full-time hire is a set budget commitment. Before hiring someone full-time, ensure that you have budget set aside for the foreseeable future. An agency is likely the highest rate based on time frame, but allows you to ramp up a large body of work in a short time frame, and to pay for functional expertise you do not need in-house over time. What level of expertise are you looking for and how involved do you want to be? Are you looking for someone with expertise to ideate and implement strategies you don’t know and be forward-thinking? 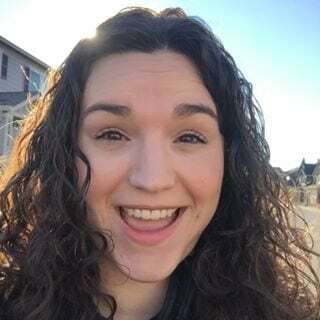 You’ll want a functionally specific resource (i.e. a Social Media Manager) or an agency, and will pay a premium. The key benefits are that you’ll be able to be super hands-off, this will drive the most growth, and could have a very high ROI. If you’re looking for someone to create and execute a body of work based on direction you give, you can expect mid-range pricing. You’ll likely need to spend a chunk of time with the person getting on the same page in terms of specific expectations, what the work looks like, how you work together, etc. This has potential to become high-value and more hands-off in the long run. If you’re looking for someone to execute clearly defined work, or set tasks, this is the cheapest and easiest way go to. Your best bet is probably a more general VA who can do your posting along with other admin tasks to save you time. You’ll need to be more hands-on directing and still creating content yourself, but can be a valuable way to go. 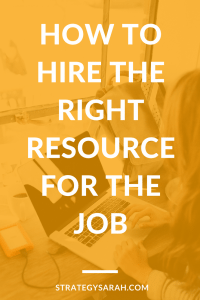 Clearly defining your resource needs and choosing the right type of resource to hire can feel like a big decision. By asking the right questions, you can hire the right resource for the job and feel confident that you have made the best choice. And remember, as your business grow and changes, you can (and will!) change the resources that you need to support and drive success. Note: For all of these, you’ll want to be especially careful to consider legalities around employees vs contractors to ensure you’re set up appropriately. There are legal and tax-based ramifications to the type of hire you choose. I am not a tax or legal expert and this should not be construed as legal advice. Please consult an attorney or CPA to ensure your resource setup is appropriate for the work.